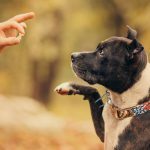 There are fewer things that throw pet owners into a tailspin more than the idea of having to administer medication to their cats. Whether it’s the fear of getting scratched or worrying you’re going to make Coco hate your for the rest of her nine lives, there’s a whole lot of anxiety involved. But giving your cat medication doesn’t have to be such a struggle. Don’t let your fear of the unknown turn you into an ailurophobic (a person who is afraid of cats). Empower yourself instead with our helpful guide to giving your cat their medication, totally stress-free. Read on for several tips that will make the process go off without a hitch – or a scratch. Even the most perfect plan to administer medication to your cat can go off the rails. Like when your furry BFF wriggles out of the swaddling you artfully wrapped him in and takes a swipe at you, it’s enough to make you want to throw in the towel. And unfortunately, no amount of cream cheese or catnip is going to change your cat’s mind about swallowing that pill. 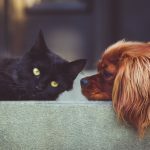 Although it might not seem like a big deal, if you’ve ever been bitten or scratched by a cat, you know how painful an experience it can be. Not only does a scratch increase your chances of getting an infection, but if untreated, it could actually land you in the ICU. Cat-scratch disease happens when the Bartonella henselae bacteria infects a wound from a cat scratch. Although 40 percent of cats carry this bacteria, kittens are more likely to have it than adult cats. Infected flea dirt is the source of the germs that can hide under their nails and travel through saliva. A cat bite can lead to a serious infection if the puncture wound is not treated right away. Because cat’s mouths are a bacteria breeding ground, it can quickly travel directly into the wound. One of the more common bacterias, Pasteurella multocida, can cause swelling, redness, and pain. If not treated, the bacteria could travel into nearby tissues, causing complications like cellulitis. Contracting septicemia, also known as “blood poisoning” can mimic fever and flu-like conditions, especially in those with compromised immune systems. You’ve gone through enough spray bottles, scratching posts, and catnip to know by now that Coco isn’t going to change her scratchy ways. If your cat’s behavior patterns feel like a never-ending battle, then it’s time for plan B. For cats with heightened aggression or behavioral issues, anti-anxiety medications are able to help dial down their symptoms. Cats who regularly bite or scratch are prime candidates for medication. Steroids are often prescribed for cats who have environmental or food allergies or are in need of suppressing their immune system. Seizures are another chronic health condition that requires owners regularly administer medication. Antibiotics are frequently used for anything from abscesses and surgeries. They help prevent infections and speed up the healing process. Keeping fleas and ticks away means giving your cat medicine on a monthly basis. Both oral and topical forms can be given to cats. At some point in your cat’s lifetime, you will have to administer medication. Whether it’s once in a blue moon after surgery or every single day for allergies, chances are pretty high you’ll need to learn how to successfully do this. Antibiotics and allergy medications are commonly given by way of a syringe. For optimum success, veterinarians recommend bringing the medication to room temperature before giving it to your cat. Also having it flavored with a cat-friendly flavor like tuna or chicken helps. A cat with diabetes or chronic kidney failure will most likely need to get their medication from a needle. 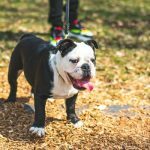 Insulin and subcutaneous fluid treatments are both medications given through an injection. Pills are the most common way for cats to ingest their medication. There are multiple techniques for giving a cat a pill that we’ll explain in more detail below. There are several ways to go about giving your cat medicine. 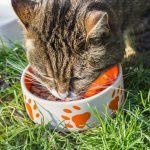 Depending on the whether your cat requires food with the medication or not will determine the best approach. Liquid medication is a bit easier to give to your cat than pills or capsules. If you’re giving the medication by yourself, make sure your cat is on a stable surface. Open the cat’s mouth by gently pushing on the corners of its mouth with your thumb and forefinger. Aim the syringe into the back of your cat’s mouth and voila! Pretty easy, right? The idea of giving pills or capsules can sometimes be nightmare fuel for cat owners. But we’d rather you have sweet dreams when it comes to giving your cat it’s medicine. If your cat needs to take medicine with food, there are a few easy options to consider. Ask your veterinarian if you can crush the pill and mix it with your cat’s food. The upside to this is you can be sneaky and avoid the drama of giving your cat a pill. The downside is your cat’s sense of smell might be so strong that it skips eating the food altogether. The effectiveness of the medication could also be at risk if your cat doesn’t eat all of its food. If you must give the pill or capsule in its whole form, sneaking it into cream cheese or deli meat is one option. 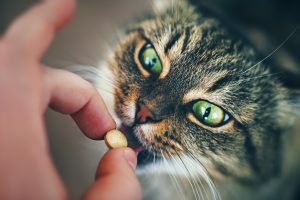 Try giving your cat a few pill-free snack samples before the real deal to get them familiar with their treat. And don’t forget to give them a treat afterward, too. Another effective option is to deliver the medicine inside of a clever pill pocket like this product. 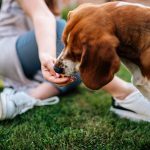 Many owners swear by pill pockets as a favorite choice for successfully administering medication to their pets. The first step is to swaddle your cat in a blanket or towel, with only their head exposed. This helps keep the cat’s claws safely under wraps and makes it easier to hold them while giving medication. Ask a friend or family member to assist you with opening their mouth and giving the pill. To make sure they have swallowed the pill, try gently rubbing their throat to stimulate their swallowing instinct. Or fill a syringe with water and wash it down. Sometimes no matter how much preparation goes into giving your cat their medicine, nothing seems to help. But don’t give up because a good veterinarian can always demonstrate how to give your cat a pill. There are also devices called pill pushers that help get the pill to the back of your cat’s throat for easier swallowing. Whether it’s your first cat or you’re a lifelong owner, we hope these tips were able to help you confidently administer medication to your cat. If you need any more information, we are the top source on the web for all things related to cat behavior. Check back regularly for more updated information.